Marvel has launched a new Blank Panther comic series. It wish written by Ta-Nehisi Coates with art by Brian Stelfreeze. The comic book is being released as Black Panther is set to make his first film appearance in Marvel's Captain America: Civil War in May. Black Panther series editor Wil Moss says in the announcement, "Ta-Nehisi, Brian, colorist Laura Martin, letterer Joe Sabino, assistant editor Chris Robinson, and I have been working on this series for months already, so we’re happy to have a launch date as we're all anxious to start getting this book out in front of people. We may be biased, but we think it's something pretty special!" 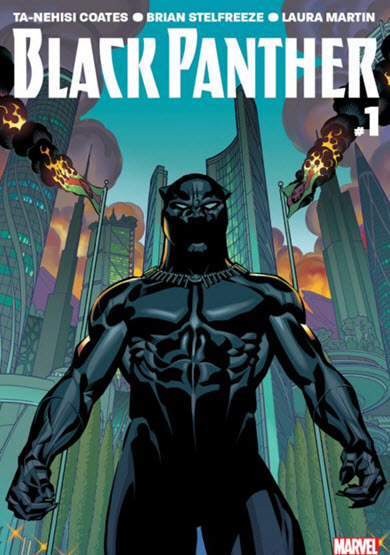 The new comic is described as a story about dramatic upheaval in the African nation of Wakanda. It also tells the story of the Black Panther’s struggle to do right by his people as their ruler. T'Challa, the current Black Panther, finds himself tested by a superhuman terrorist group known as the People. The People has parked a violent uprising among the citizens of Wakanda. The new comic retails for $4.99. It is available for purchase on Amazon.com.